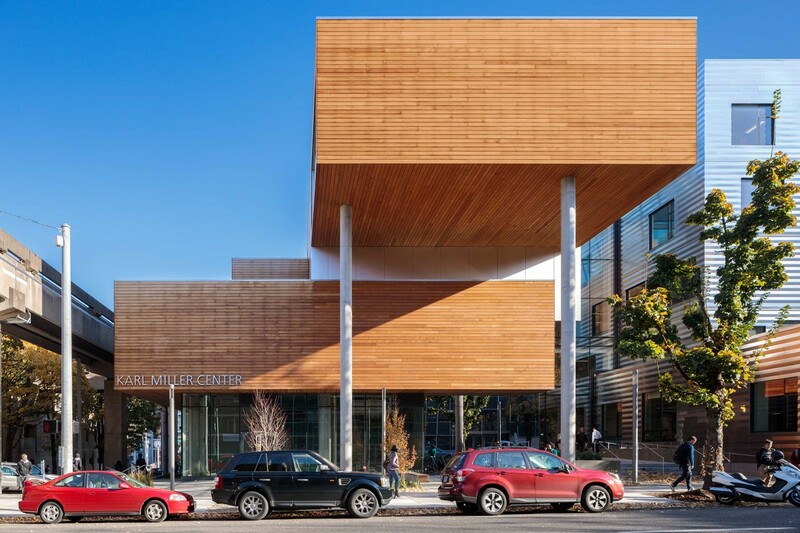 Located in downtown Portland, the new Karl Miller Center is uniquely integrated with the city’s rich network of public open spaces and diverse urban uses. Questioning the full-block archetype that dominates the typical 200' x 200' city block of Portland, the building design appears as two distinct structures sharing a city block - the renovated existing building, a 100,000sf 1970's structure retrofitted with a metal panel facade system broken up by an irregular composition of punched windows, and a new dynamic, shifting 45,000sf addition, clad in regionally sourced Alaskan Yellow Cedar. This approach, coupled with a series of terracing external green spaces and new circulation pathways linking the urban center, local parks, transportation stops, and nearby campus buildings, enhances the public realm by providing a more diverse streetscape. 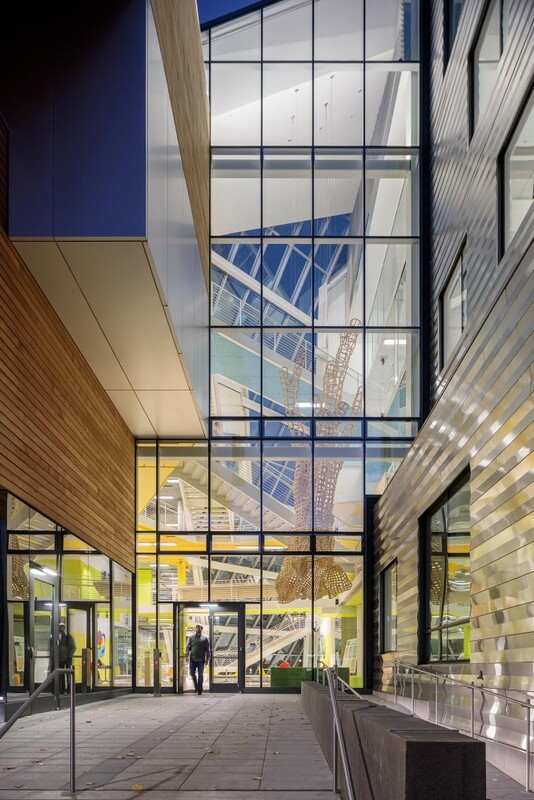 A one-story grade differential between 6th Avenue and Broadway, populated with public oriented spaces, creates two ground levels, further activating the exterior plazas and the atrium and heightening the activity within and around the building. 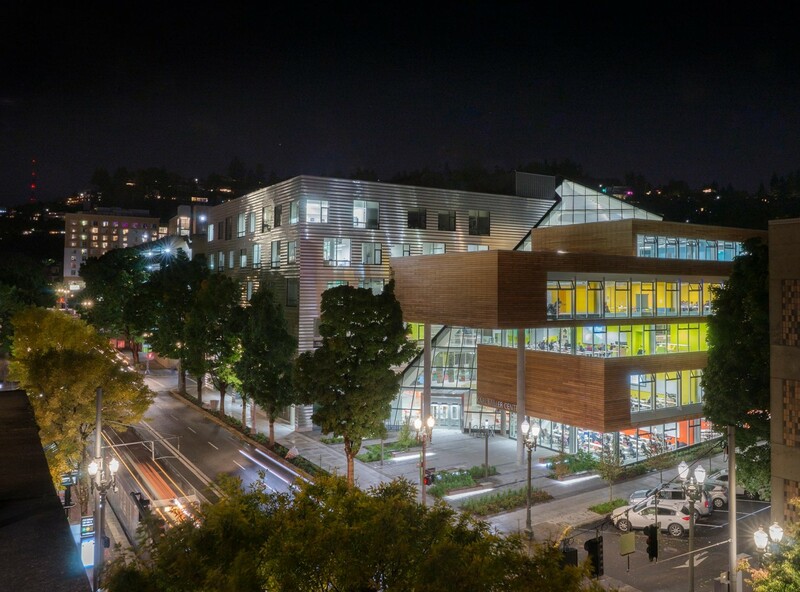 Centered around a five-story glass atrium that is animated with activities, the School of Business benefits from a diverse program. 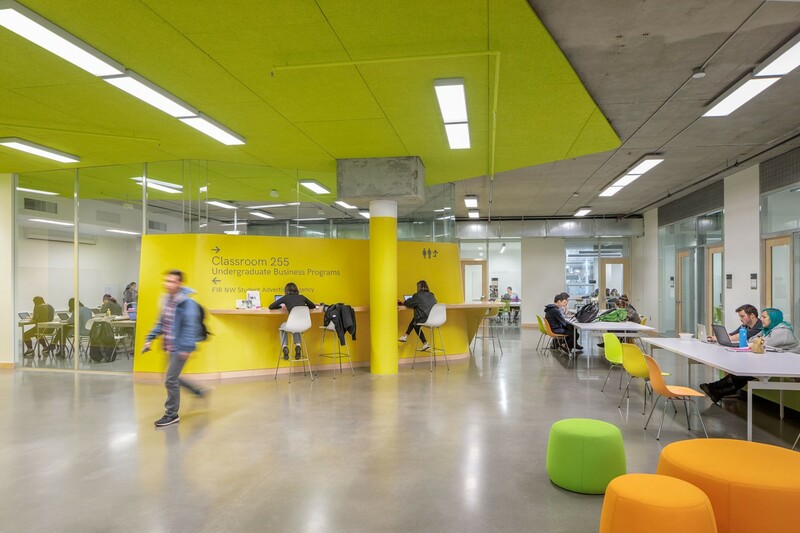 By arranging a variety of spaces – informal meeting and study areas, gardens, classrooms, business incubators, student spaces, faculty and administrative offices and retail – to maximize communication and connectivity, the project promotes an inclusive attitude toward learning. 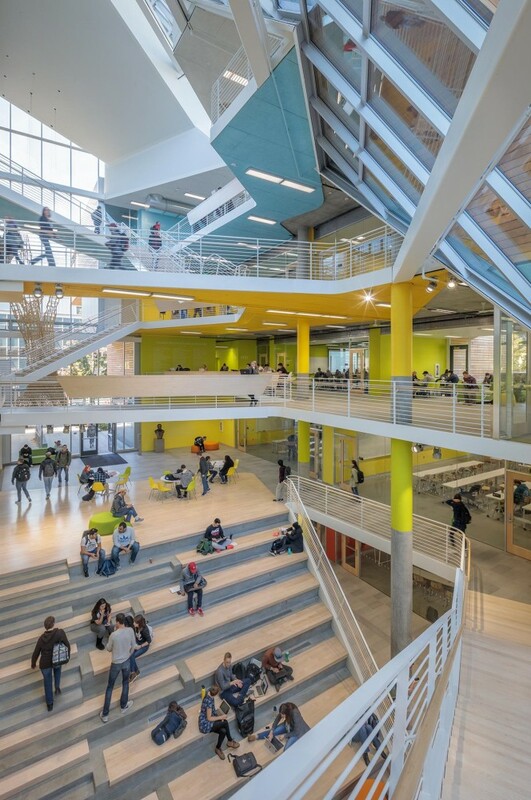 Flexible, student-focused informal learning spaces are evenly distributed throughout the building to act as social anchor points helping to elevate the space beyond a transitional corridor and create a pedestrian-friendly space for students and the greater University community. Taking advantage of Portland’s temperate climate, all new construction is designed without any mechanical cooling equipment. 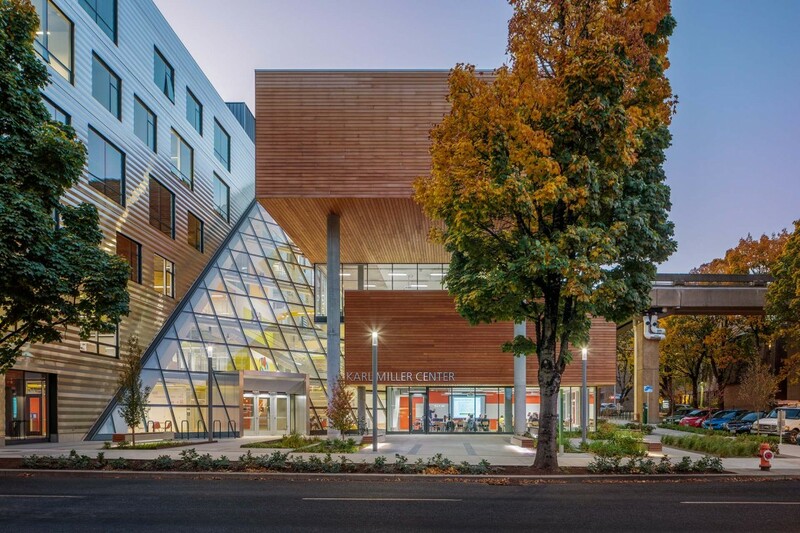 Utilizing passive sustainable strategies to minimize the environmental impact while simultaneously prioritizing human comfort and wellbeing, this new social hub is expected to achieve LEED Platinum status; continuing Portland State University's reputation as an institution dedicated to social, economic, and environmental sustainability. 13.330 qm / 145,000 sq.ft. 53.023 cbm / 1,872,500 cu.ft.